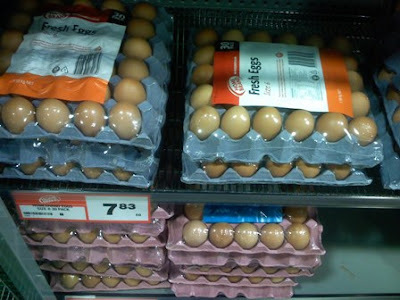 These are eggs sold here in New Zealand. Notice something different about them? There are also white eggs here, but it's not a common sight. Eggs though, are one of the things we see almost everyday that we take it as an ordinary food items. But it was eggciting to learn that eggs actually have a thin protective coating outside the shell which protects the inside from contaminants and that washing the egg dramatically reduces its shelf life. And that the shell is porous (this we learned actually in grade school through an osmosis experiment). And that there are actually "veins" that help the yolk stay suspended in the white matter. So where can you get these nifty facts, and grab a couple of free smashing egg recipe books? At the Home of the Incredible Edible Egg, that's where! Get tips on how to cook the nicest omelette, how to poach, boil, scramble, sunny side-up, and mix up the egg with other ingredients to make a snazzy dish! And download the cookbooks for free! Those are fresh organic eggs, right? I even saw an egg with light green shells, another organic egg, I learned. Dyosa: I have just checked the packaging, and it does not say organic. However, I noticed in the supermarket that some boxes say "free range eggs", meaning the chickens are able to roam around in a farm vs being cooped up in a cramped quarters. free range eggss are now available here in manila. i saw soem at cherry foodarama a while back and at some gourmet groceries. i'll check out that website. thanks for sharing! Mikky: you're welcome! Thanks for dropping by. Ryan: that's great news. It means poultry is also being treated better.